Attendance at RECONNECT seems to have plateaued at around 400 users - with Oracle and consultants probably around 500 people were in attendance. While a far cry from the days of PeopleSoft CONNECT, a conference dedicated to the needs of PeopleSoft customers is at least a glass half full. As advertised, this is a "deep-dive" PeopleSoft event: the 150 or so sessions were mostly detailed looks at newer features and technologies - (Work Centers, PUM, App Engine Tracing, Fluid UI) or discussions on how to use/configure PeopleSoft to meet changing business requirements (Affordable Care Act, Mobility, and Finance Transformation). 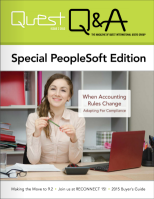 Although I remain a bit puzzled as to why Karen Brown (the Product Manager for JD Edwards Financials) was featured on the cover of Quest's Special PeopleSoft Edition Q & A magazine, high marks were earned by the conference board and session selection committee. Over the past few years RECONNECT has established itself as a top event for PeopleSoft customers. As Daniel Naujokas pointed out in his review on the PeopleSoft Enterprise Support Blog RECONNECT may not have the name recognition of other conferences, but for those people looking for the details on PeopleSoft, this conference is one customers should consider attending.